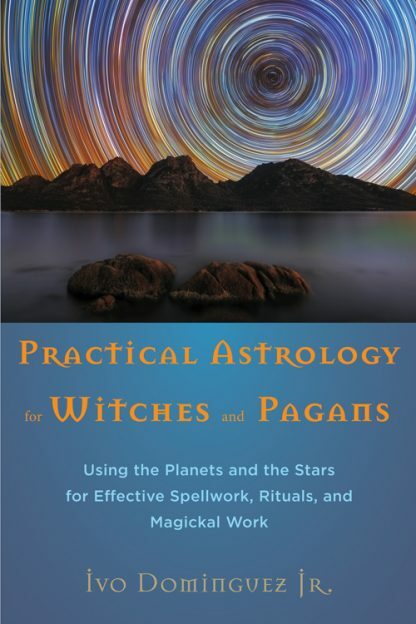 Red Wheel ∕ Weiser Online Bookstore | Practical Astrology for Witches and Pagans: Using the Planets and the Stars for Effective Spellwork, Rituals, and Magickal Work by Ivo Dominguez, Jr.
More often than not, people think of astrology as a tool for divination or the exploration of one�s personality. Astrology is considerably more than that. It is a sacred science, a highly descriptive symbolic language, and it is also a technology that can be applied to ritual, herbalism, the use of crystals, and much more. But it can be daunting to take on the study of Astrology. After all, it�s a field so huge it would take several lifetimes to master it. And that�s why Ivo Dominguez, Jr., wrote this book�to provide practitioners of magick with a Pagan perspective on Astrology and the core concepts of Astrology that are most useful to building rituals and creating effective magick. When we look at an astrological chart, what we are actually looking at is a map of the multiple planes of existence summarized and flattened into an understandable diagram�a kind of magickal cartogram. Now, what to do with this map? How can we best use it in our magickal work? That�s precisely what you�ll discover in the pages of this concise, focused, and expertly presented book. Ivo Dominguez, Jr., a visionary and practitioner of a variety of esoteric disciplines, was a founding member of Keepers of the Holly Chalice, the first coven of the Assembly of the Sacred, a Wiccan syncretic tradition that draws inspiration from astrology, Qabalah, the Western Magickal Tradition, and the folk religions of Europe. Ivo, a professional astrologer, has studied astrology since 1980. Listen to Ivo Dominguez, Jr. on the Weiser Books Radio Hour!